One of our most successful crops this year in the Secret Garden was the tomatillos. We grew them last year specifically for MsMarmiteLover’s Frida Kahlo dinner and we liked them so much that we planted again this year. These are tomatillos: tall spreading plants that need support, and these are the fruits themselves, looking like green tomatoes in a papery husk. If they remind you of physalis (Cape Gooseberries) that’s because they are closely related. 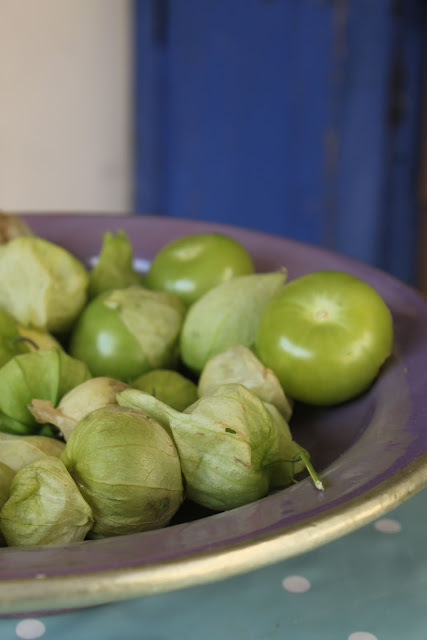 Tomatillos are also cousins of potatoes, tomatoes and so also of aubergines – all members of Solanaceae. (If you grow potatoes you may have noticed that the potato plants sometimes produce small green berries that look similar to a tomatillo. Don’t be tempted to try them: potato berries are poisonous – as indeed is the entire plant, apart from the tubers). We’re particularly pleased that the tomatillos have done well this year because it was such a poor year in general for them. Tomatillos like warmth and sunshine – they are really a subtropical plant and the fruit is typically used in Mexican cooking. Our climate in north London is far from Mexican. If you read the books or online, many people say that they should really be raised in a greenhouse, and maybe they would be more prolific if so. But they have done well here. This is another plant which needs to be sown indoors, then planted out once all danger of frost is over. They like a well-drained soil, a sheltered spot and plenty of sun, so choose your planting spot carefully. Don’t just plant them straight into our clay, but dig in some organic matter before you transplant. We mulched the whole of the garden with horse manure last winter and it has paid off in terms of soil quality this year. You also need to give each plant plenty of space. It’s hard to imagine when you transplant your tiny seedling but they will grow quickly into this 1.6m high, spreading plants. The stems are quite slim and green as well, so you will need to give them a cane support as they grow – another reason for not putting them in too exposed a place. 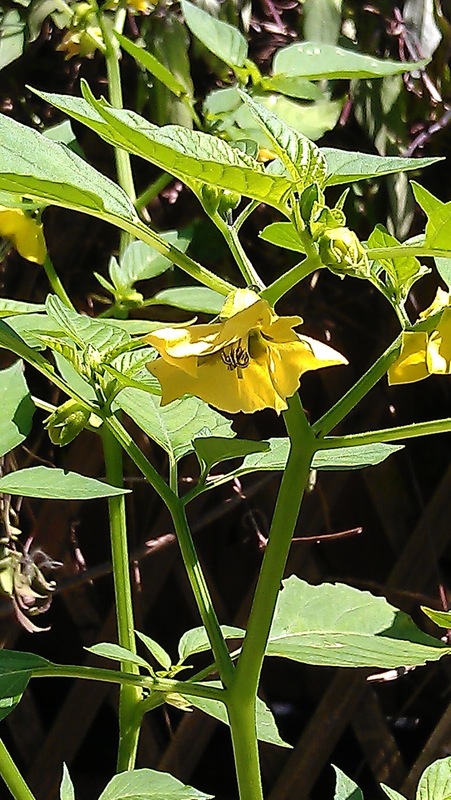 But make sure you plant at least two reasonably close together -these plants do not self-pollinate and need another tomatillo nearby to ensure pollination, Without pollination, there will be no fruit. Protect the seedlings from slugs when you first plant them out – once they’re established and bigger the slugs find them less tasty. Once you have ensured the plants have support you can pretty much leave them to their own devices. They don’t need huge amounts of regular water like tomatoes – in fact they don’t like sitting in the wet at all and here in London with our clay soil we probably don’t have soil as well-drained as the tomatillo would like. The flowers should come in June and July and then in August you’ll see the first husks forming. If you pinch the young husks you’ll feel the developing fruit, about the size of a pea at first, but swelling quickly into the size of a big gobstopper, or eyeball. Once the husk starts to turn pale and split, the fruit is ready to pick. Leave them too long and they’ll start falling off the plant. Tomatillos aren’t eaten raw but lightly cooked – either simmered or roasted – to form the basis of a Mexican salsa or green sauce. They’re also superb in chutneys. The tase is one of zingy freshness – halfway, say, between a tomato and a cucumber. Saving seeds: we’ll be saving seeds from the tomatillos this year, so that we can sow our own seeds again next spring. This is a fairly simple process – and remember if it’s just for you, you don’t need so very many seeds. Choose two to three good-sized, healthy-looking fruits to save and leave them on the plant after you’ve harvested the rest. Don’t let them get frosted – if there is frost forecast, cut the fruit at the stem, leaving a length of stem and bring into the house to finish maturing. After about a week, the fruit may look past its eating best, but the seeds should be ripe. Break open the tomatillo – you can cut it with the knife, the seeds are tiny and hard and quite tough. 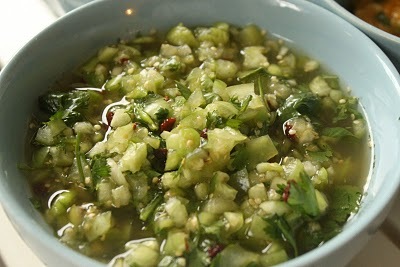 Put the tomatillo pieces in a bowl with some cold water, then mash up the fruit. Either use the handle of a knife as though you were crushing a clove of garlic, or rub the tomatillo pieces with your fingers until the seeds start to separate from the flesh, keeping the fruit underwater. You can also put the resulting mush in a fine sieve – not a colander or you’ll lose all your seeds. Rinse well with cold water, again rubbing the flesh with your fingers to loosen the fibres and flush out the seeds. Repeat until the seeds are well separated from the fruit. Put the remaining flesh and seeds back into the bowl and cover with water again. The heavy seeds -the good seeds – will sink to the bottom. The light seeds – which are not viable – and fibres will rise to the top. Leave the bowl alone while the seeds settle, then pour off the surface flesh and seeds, leaving you with just the good ones. You may find the seeds come away nice and easily just mashing with your hands, or you may have to repeat the process above once or twice to get the seeds really clean and free of fibrous material. Once you have clean wet seeds, lay them on a tea towel to get the excess water off, then finish drying them on a flat glass or stone surface. Don’t be tempted to try kitchen paper, or leave them on tea towel, or even a porous material like wood. The seeds are very sticky and will glue themselves to anything remotely absorbent. Also, let them dry at room temperature – don’t be tempted to try to speed up the process in an oven, or in the sun. Once the seeds are completely dry, tip them into a sealable paper bag or envelope and label them clearly with the name of the vegetable and the date. This last is very important! Keep them in the dark, somewhere cool and dry. They should keep for up to three years. PS: should you not have a garden, this year Riverford Organics have been growing tomatillos and you can request to add them to your box. Yes it's amazing how difficult they are to get hold of in the Uk when they are so easy to grow. I even spoke to the grower at The Isle of Wight Tomato stall company and he said they were too hard to grow. Rubbish! Actually another thing. You can use tomatillos raw. I use them raw for my salsas. If you let the tomatillos go wrinkly, they are even better raw.